^ a b Bellamy, Christopher (2001). Richard Holmes (ed.). The Oxford Companion to Military History: Crimean War. Oxford University Press. ISBN 0-19-866209-2. 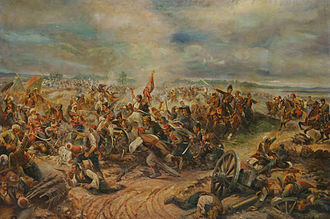 The Battle of Inkerman was fought during the Crimean War on 5 November 1854 between the allied armies of Britain and Ottoman Empire against the Imperial Russian Army. The battle broke the will of the Russian Army to defeat the allies in the field, the role of troops fighting mostly on their own initiative due to the foggy conditions during the battle has earned the engagement the name The Soldiers Battle. 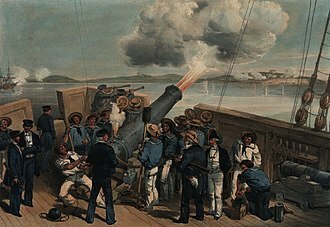 The allied armies of Britain, France and the Ottoman Empire had landed on the west coast of Crimea on 14 September 1854, intending to capture the Russian naval base at Sevastopol. 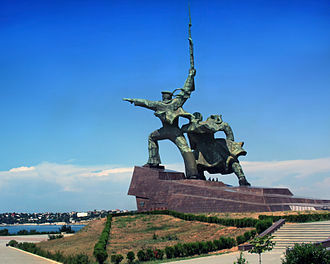 The allied armies fought off and defeated the Russian Army at the Battle of Alma, they resolved to march around the city, and put Sevastopol under siege. Toward this end the allies marched to the southern coast of the Crimean peninsula, before the siege of Sevastopol began, the Russian commander Prince Menshikov evacuated Sevastopol with the major portion of his field army, leaving only a garrison to defend the city. Balaclava revealed the weakness, their siege lines were so long they did not have sufficient troops to man them. Realising this, Menshikov launched an attack across the Tchernaya River on 4 November 1854, on 5 November 1854, the Russian 10th Division, under Lt. General F. I. Soymonov, launched an attack on the allied right flank atop Home Hill east from the Russian position on Shell Hill. The assault was made by two columns of 35,000 men and 134 field artillery guns of the Russian 10th Division, when combined with other Russian forces in the area, the Russian attacking force would form a formidable army of some 42,000 men. The initial Russian assault was to be received by the British Second Division dug in on Home Hill with only 2,700 men and 12 guns, both Russian columns moved in a flanking fashion east towards the British. They hoped to overwhelm this portion of the Allied army before reinforcements could arrive, the fog of the early morning hours aided the Russians by hiding their approach. Not all the Russian troops could fit on the narrow 300-meter-wide heights of Shell Hill, General Soymonov had followed Prince Alexander Menshikovs directive and deployed some of his force around the Careenage Ravine. 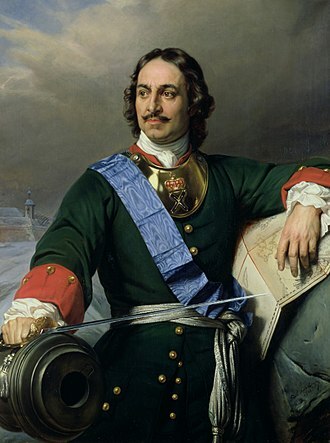 Thus, Soymonov could not effectively employ all of his troops in the attack, when dawn broke, Soymonov attacked the British positions on Home Hill with 6,300 men from the Kolyvansky and Tomsky regiments. Soymonov had a further 9,000 in reserve, the British had strong pickets and had ample warning of the Russian attack despite the early morning fog. The pickets, some of them at company strength, engaged the Russians as they moved to attack, the firing in the valley gave warning to the rest of the Second Division, who rushed to their defensive positions. Pennefather did not know that he was facing a superior Russian force, thus he abandoned Evans plan of falling back to draw the Russians within range of the British field artillery which was hidden behind Home Hill. Instead, Pennefather ordered his 2,700 strong division to attack, when they did so, the Second Division faced some 15,300 Russian soldiers. 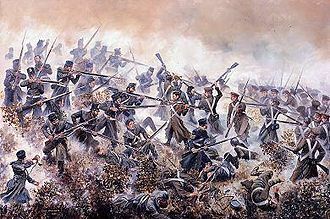 The Battle of the Great Redan was a major battle during the Crimean War, fought between British forces against Russia on 18 June and 8 September 1855 as a part of the Siege of Sevastopol. The French army successfully stormed the Malakoff redoubt, whereas a simultaneous British attack on the Great Redan to the south of the Malakoff was repulsed. Contemporary commentators have suggested that, although the Redan became so important to the Victorians, the fort at Malakhov was much more important and it was in the French sphere of influence. It was when the French stormed it after a siege that the final. Russia attacked the Ottoman Empire in 1853, aiming for territorial aggrandisement, the Anglo-French navies entered the Black Sea with the intent of destroying the Russian fleet. After destroying the naval base at Odessa their attention turned to the main Russian base at Sevastopol. Landing at Eupatoria, the allies swept aside the Russian army at the Battle of the Alma, the allies marched to Sevastopol and invested it. Russian attempts to break the siege failed, and the French refused to make aggressive movements against the Russian fortifications and this changed on 16 May 1855 when Pélissier assumed command of the French Army, and agreed with Lord Raglan that the Russian fortifications should be assaulted. This led to three allied offensives in the summer of 1855, the last of which overwhelmed the Russian defenses, by spring of 1855 the British controlled the central sector of the allied line. The British right attack faced the Russian Bastion No.3 commonly called the Great Redan, the British left attack faced Bastion No. 4, called the Flagstaff Bastion by the British, on the left the French 1eme Corps faced Bastions no. 4,5 and 6 and the right the French 2e Corps faced Bastions No.2, the first allied offensive was intended to gain ground and advance the parallels. After several days of bombardment the two attacks, one British and one French, were successful and the allies held all their gains against heavy Russian counterattacks. The Siege of Taganrog is a name given in some Russian histories to Anglo-French naval operations in the northeastern part of the Sea of Azov between June and October 1855 during the Crimean War. British and French forces were implementing a strategy of destroying the supply lines for the main Russian army which ran across the Sea Azov. 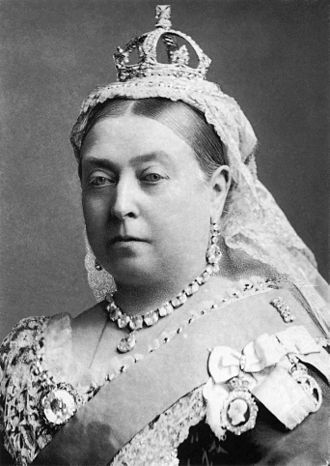 In the spring of 1855, as the Crimean War dragged on into its third year, the British and the French decided to begin operations in the Sea of Azov. They reasoned that this would allow them to cut off the Crimea even further from Russia and this strategy required them to occupy the Strait of Kerch, which was to be undertaken by a joint force of British and French soldiers and warships. Taganrog, at the far end of the Sea of Azov, was selected as a potential target for attack. Taganrog is located on a strip of land jutting out slightly into the Sea of Azov and, to the British, taking Rostov-on-Don would allow the allies to threaten the rear of the Russian forces. Plans were drawn up, and the British and French prepared 16,000 ground troops, Taganrogs governor-general, Nikolay Adlerberg, had been replaced by Yegor Tolstoy, an ageing but versatile general, who had served in the Russian Army in fighting against the Turks. In April 1854, Tolstoy assumed command at Taganrog, along with Ivan Krasnov and he had three sotnias of Don Cossacks and a local garrison of some 630 soldiers at his command at the time of the siege. A unit of home guards, totalling 250 men, were recruited from the local population, Taganrog lacked any modern fortifications and Tolstoy had no artillery to speak of. A four-oared gig that landed Lt Cecil Buckley and Boatswain Henry Cooper HMS Sulina and HMS Medina along with Danube towed the launches to outside Taganrog, similarly the French paddle aviso Dauphin,2 towed their launches, but did not approach the city. The light forces were split into two groups, one under Commander Coles was to bombard the store, and a group under Lt J. F. C.
Mackenzie, RMA landed and covered Buckley and Cooper, starting on 24 May,1855, the British and the French began operations in the Sea of Azov. They landed troops on either side of the Kerch Strait, quickly capturing the cities of Kerch, following those actions, naval forces destroyed the Russian coastal battery at Kamishevaya Bay and entered the Sea of Azov. 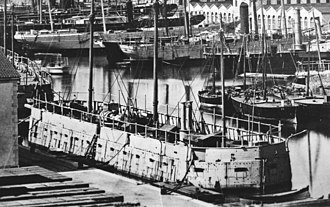 On the 2nd HMS Recruit was sent forward to reconnoiter Taganrog, accompanying the Recruit were the British paddle steamer Danube, the French paddle aviso Mouette, and many small launches from larger ships operating elsewhere. These included 12 British armed steam launches,4 similarly armed French launches, from this sprang ultimately the modern turret used aboard warships. The allies demanded the surrender of all government property, the withdrawal of troops, after an hour of consideration Baron Pfeilizer-Frank returned to the envoys with Tolstoys reply, rejecting the demands. 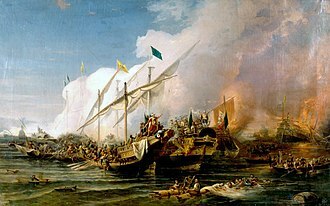 The Recruit hauled down her flag of truce and opened fire on the town, the Danube and Mouette, towing the Lady Nancy moved up in the company of the armed launches and joined in the bombardment. Sevastopol or traditionally Sebastopol is a city located in the southwestern region of the Crimean Peninsula on the Black Sea. Sevastopol has a population of 393, 304 , concentrated mostly near the Bay of Sevastopol, the location and navigability of the citys harbours have made Sevastopol a strategically important port and naval base throughout history. The city has been a home to the Russian Black Sea Fleet, although relatively small at 864 square kilometres, Sevastopols unique naval and maritime features provide the basis for a robust economy. The city enjoys mild winters and moderate summers, characteristics that help make it a popular seaside resort and tourist destination. The city is an important centre for marine biology, in particular, the name of Sevastopolis was originally chosen in the same etymological trend as other cities in the Crimean peninsula that was intended to reflect its ancient Greek origins. It is a compound of the Greek adjective, σεβαστός and the noun πόλις, Σεβαστός is the traditional Greek equivalent of the Roman honorific Augustus, originally given to the first emperor of the Roman Empire and awarded as a title to his successors. Despite its Greek origin, the name itself is not from Ancient Greek times, the city was probably named after the Empress Catherine II of Russia who founded Sevastopol in 1783. She visited the city in 1787 accompanied by Joseph II, the Emperor of Austria, in the west of the city, there are well-preserved ruins of the ancient Greek port city of Chersonesos, founded in the 5th century BC by settlers from Heraclea Pontica. This name means peninsula, reflecting its location, and is not related to the ancient Greek name for the Crimean Peninsula as a whole. In English the current spelling has the pronunciation /səˈvæstəˌpoʊl/ or /ˌsɛvəˈstoʊpəl/, whilst the spelling has the pronunciation /sᵻˈbæstəpəl, -pɒl/ or /səˈbæstəˌpoʊl. 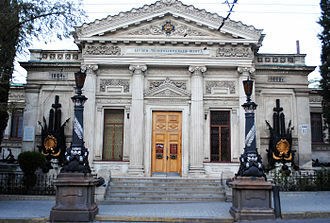 Ukrainian, Севастополь, Russian, Севастополь, pronounced in Ukrainian, in the 6th century BC a Greek colony was established in the area of the modern-day city. 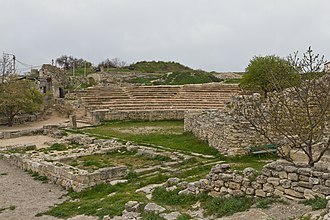 The Greek city of Chersonesus existed for almost two years, first as an independent democracy and as part of the Bosporan Kingdom. The Battle of Eupatoria was the most important military engagement of the Crimean War on the Crimean theatre in 1855 outside Sevastopol. Ottoman forces were being transferred from the Danube front to the Crimean port of Eupatoria, Khrulev hoped to take the Ottoman garrison by surprise on 17 February 1855. His intention failed to materialise, as both the Ottoman garrison and the Allied fleet anticipated the attack, the Russian artillery and infantry attacks were countered by heavy Allied artillery fire. Failing to make progress after three hours and suffering mounting casualties, Khrulev ordered a retreat and this reverse led to the dismissal of the Russian Commander-in-Chief Alexander Sergeyevich Menshikov and probably hastened the death of Nicholas I of Russia, who died several weeks after the battle. As for the strategic importance, it confirmed that allied total command of the sea would ensure that the threat to the Russian flank would remain for the duration of hostilities. For the allies, possession of Eupatoria meant that the investment of Sevastopol remained a viable option. The Allies decided against an immediate assault on Sevastopol and instead prepared for a protracted siege. However, this committed the British to the defence of the right flank of the Allied siege operations. 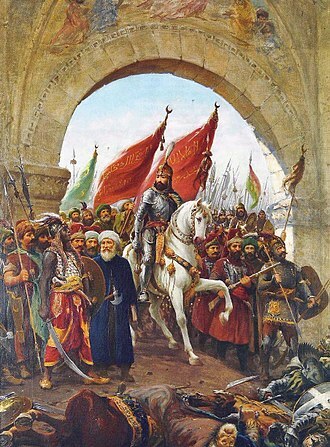 The battle began with a Russian artillery and infantry attack on the Ottoman redoubts that formed Balaclavas first line of defence, the Ottoman forces initially resisted the Russian assaults, but lacking support they were eventually forced to retreat. When the redoubts fell, the Russian cavalry moved to engage the second defensive line held by the Ottoman, the British and French fleets departed from the Bulgarian port of Varna on 5 September 1854, heading towards Kalamita Bay in the Crimea. By the 14th, the troops began to land, within four days the Allied force of 61,400 infantry,1,200 cavalry and 137 guns, was ashore. 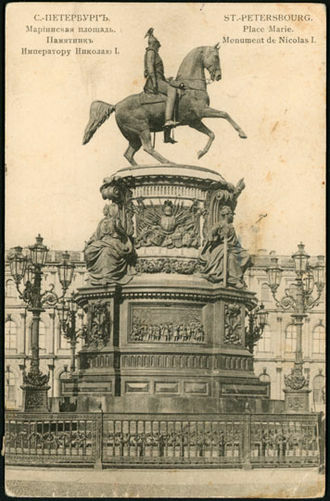 News of Menshikovs defeat was met with disbelief by Tsar Nicholas I in St. Petersburg – it seemed it would only be a matter of time before Sevastopol fell. It is frightful to think what might have happened, wrote Vice-Admiral Kornilov, had it not been for this error of the enemys. John Burgoyne, the British Armys most experienced engineer, advocated an attack on Sevastopol from the south which and this was a view shared by Saint-Arnaud who, having received his own intelligence of Russian reinforcements, had refused to agree to an attack from the north. Burgoynes proposed flank march required the Allies to go round the city to the east in order to attack the harbour from the south where the defences were weakest. Whilst Menshikov moved east, the Anglo-French-Turkish army, with the British in the vanguard, the heat was oppressive, the water sparse, and cholera rife, taking a heavy toll on the men including Saint-Arnaud who was already ill with cancer. The march had been a trial and was not without incident. By the 26th, Raglan had reached the village of Kadikoi and that same day Saint-Arnaud, now critically ill, surrendered his command to General Canrobert. The harbour at Balaclava was too small for both Allied armies to use, by rights the French, who had claimed the honour of holding the right of the line, should have occupied Balaclava whilst the British should have moved west to the ports of Kazatch and Kamiesh. Field Marshal FitzRoy James Henry Somerset, 1st Baron Raglan, GCB, PC, known before 1852 as Lord FitzRoy Somerset, was a British Army officer. As a junior officer he served in the Peninsular War and the Hundred Days and he took part in politics as Tory Member of Parliament for Truro before becoming Master-General of the Ordnance. He became commander of the British troops sent to the Crimea in 1854, after an early success at the Battle of Alma, a failure to deliver orders with sufficient clarity caused the fateful Charge of the Light Brigade at the Battle of Balaclava. 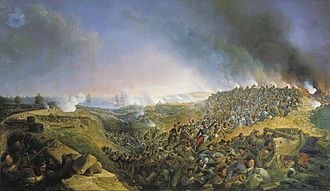 Despite further success at the Battle of Inkerman, an allied assault on Sevastopol in June 1855 was a complete failure. Raglan died that month from a mixture of dysentery and clinical depression, promoted to lieutenant on 1 June 1805, Somerset accompanied Sir Arthur Paget on his visit to Sultan Selim III of the Ottoman Empire, who had been aligning himself too closely with France, in 1807. He became a captain in the 43rd Regiment of Foot on 5 May 1808 shortly before his appointment as aide-de-camp to Sir Arthur Wellesley in July 1808, Somerset accompanied Wellesleys Army when it was sent to Portugal that month. Somerset fought at the Second Battle of Porto in May 1809, the Battle of Talavera in July 1809, promoted to brevet major on 9 June 1811, he took part in the Battle of El Bodón in September 1811. They fought together at the Battle of the Nive in December 1813, the Battle of Orthez in February 1814, following Wellingtons appointment as British Ambassador during the short period of Bourbon restoration, Somerset assumed a role as his secretary at the Embassy on 5 July 1814. Somerset transferred to the 1st Guards on 25 July 1814 and was appointed a Knight Commander of the Order of the Bath on 2 January 1815. 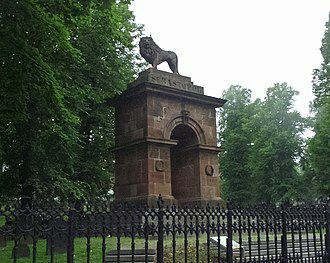 Somerset saw action during the Hundred Days, he served on Wellingtons staff at the Battle of Quatre Bras on 16 June 1815 and at the Battle of Waterloo two days later. Promoted to colonel and appointed an aide-de-camp to the Prince Regent on 28 August 1815 and he remained with the Army of Occupation in France until May 1816 when he returned to the post of secretary at the British Embassy in Paris. Somerset was elected Tory Member of Parliament for Truro in 1818, Somerset lost his seat at the general election in 1820 but, having been promoted to major-general on 27 May 1825, regained his seat in Parliament in 1826. Following Wellingtons appointment as Commander-in-Chief of the Forces in January 1827 Somerset became Military Secretary in August 1827 and he stood down from Parliament in 1829 and was promoted to lieutenant-general on 28 June 1838. Raglan became commander of the British troops sent to the Crimea with the rank of full general on 21 February 1854 and was promoted to the substantive rank of full general on 20 June 1854. An Anglo-French force under the joint command of Somerset and General Jacques St. Arnaud defeated General Alexander Menshikovs Russian army at the Battle of Alma in September 1854 and he was awarded the Ottoman Empire Order of the Medjidie, 1st Class on 15 May 1855. A piecemeal allied assault on Sevastopol on 18 June 1855 was a complete failure, the anxieties of the siege began to seriously undermine Raglans health and he died from a mixture of dysentery and clinical depression on 29 June 1855. Commemorative plaque honouring François Certain de Canrobert and Adolphe Niel in Carpenedolo. The Eglantine Castle, built in the middle of the 19th century by Marshal Canrobert. Alfred Lenoir, details of the Statue of Marshal Canrobert (1897) at Saint-Céré. Commemorative plaque honouring François Certain de Canrobert in Castel Goffredo. Cannons which were used to defend Petropavlovsk in 1854. Cossack Bay, Balaclava. Photo: Roger Fenton c. 1855. 1st Baron Raglan, British commander-in-chief. Photo: Roger Fenton. The Thin Red Line by Robert Gibb. Campbell's 93rd Highlanders repel the Russian cavalry. Omar Pasha on a horse, unknown date. Totleben Monument in Sevastopol (1909). Russian ships at the Battle of Sinop, by Ivan Aivazovsky. Battle of the Chernaya, the forces at the beginning of the battle and the Russian advance. La battaglia della Cernaia, Gerolamo Induno.